Couples in unmarried cohabiting relationships, failing marriages and multiple subsequent marriages are becoming increasingly more common in current Australian society, which is why binding financial agreements are becoming increasingly more prevalent. What kind of Binding Financial Agreements are there? 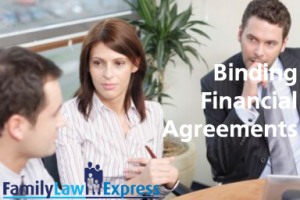 The term “Binding Financial Agreement” encompasses several types of contractual agreements such as Cohabitation Agreements, Pre-nuptial Agreements, Post-Nuptial Agreements, Divorce Agreements and Separation Agreements. A pre-nuptial agreement is entered into before a couple gets married. A post-nuptial agreement is entered into after the couple is married. Divorce and Separation agreements are entered into by divorcing or separating couples. Cohabitation agreements are entered into by couples who will, do or have lived together. Who can enter into a Binding Financial Agreement? Binding Financial Agreements can be entered into by heterosexual or homosexual de facto couples, married or intending to marry, divorced, separated, cohabiting or intending to cohabit. However, each person must have received separate legal advice from different lawyers working in different law firms. It is also important to note that a person cannot enter into multiple BFAs with different people at the same time. When can you enter into a Binding Financial Agreement? Binding Financial Agreements can be entered into by married couples before, during, or after their marriage, or after they divorce. De facto couples can enter into a BFA before they commence living together, during their cohabitation together or after they separate. According to the sections 90 G1 3 and 90UJ(1) 4 of the Family Law Act 1975 (Cth), in order for a Binding Financial Agreement to be an enforceable agreement there are several requirements that need to be met. There must be a signed agreement and before the agreement has been signed the parties must receive legal advice required by the Act. Either before or after the parties have signed the agreement, each party’s legal practitioner must provide a statement to that party that the requisite advice has been given and a copy of the statement to the other party. Also, the agreement must not have been terminated or set aside by the court in order to still be valid. The recent ‘Pole Dancer Case’ is a landmark decision that has established that although wording in the Family Law Act before 2010 was relaxed in regards to the requirement for binding financial agreements to include statements that legal advice had been given to clients and signed by solicitors, BFAs created within those times are still valid. The issue of ensuring each party has obtained the necessary legal advice has been discussed in Hoult v Hoult , where it was held that certificates given with financial agreements do not amount to evidence that sufficient legal advice has been given by solicitors. This is crucial because if the requirements of sufficient legal advice are not met, the agreement may be invalid. Even small mistakes such as minor technical flaws made while drafting binding financial agreements can cause the whole agreement to be invalid, which is why it is of the upper most importance that agreements adhere strictly to the requirements set out in the Family Law Act (Cth). An example of this can be seen in the recent high profile Grant Hacket case, where an error in his pre-nuptial agreements due to alleged negligence on behalf of his lawyers caused the couple’s agreement to fail, resulting in financial losses for Grant Hacket upon the ending of his marriage. What do Binding Financial Agreements look like? Sample pre-nuptial agreements can be found in the Sample Legal Documents module on Family Law express, while a legal practitioners factsheet on pre-nuptial agreements can be found in the Family Law Factsheets module.